QWhat is the delivery time? Usually the Dinxx can be shipped in 8 workdays. When you have chosen to embroid a name on the straps, we will ship them at the same time as the Dinxx slings. QHow do I maintain the Dinxx slings? The slings do not need maintenance. The red cord could be replaced if it has become well-worn. QHow can I test the Dinxx slings? You cab test a Dinxx sling by actualy using them! Please contact Dinxx or one of our dealers to provide you with a demo set. QIs the Dinxx strong enough for my shells? Every shell is supported by four straps of two Dinxx slings. A coxed eight or even a heavy wherry is easily supported. QFor what type of shells are Dinxx suitable? All types of boats from van 8+ to skiff , C-boats and even wherry’s. Dinxx slings are even adjustable for specific type of boats big or small. QEvery shell is supported by four straps of two Dinxx slings. A coxed eight or even a heavy wherry is easily supported. The Dinxx slings are a perfect fit for every rowing shell, ranging from coxed eights to the single. 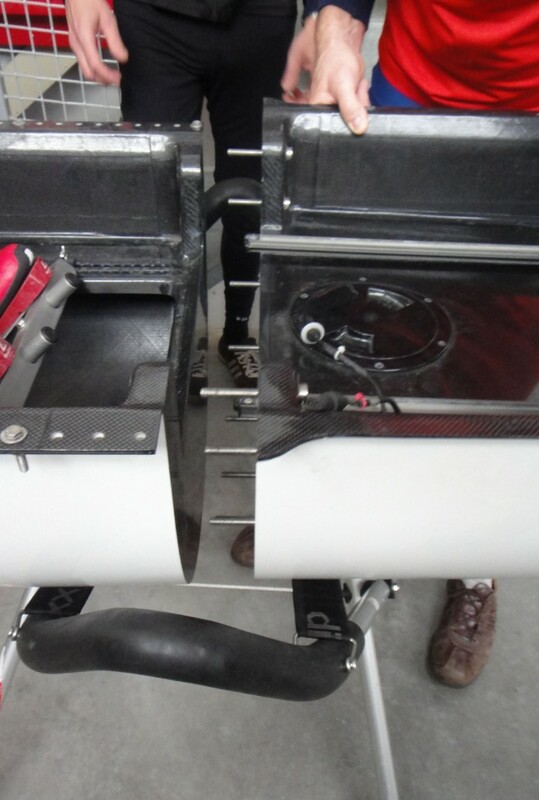 The Dinxx is even adjustable for small and larger rowing shells. QDoes the shell fit upside down as well? Yes, the rowing shells can also fit upside down. QHave the Dinxx slings been tested? Hudson Canada has tested the Dinxx slings for over a year at larger regattas throughout the USA and Canada. With the help of their feedback we further adjusted several details. QWhy is the Dinxx also stable on unequal surfaces? With the help of the strong and flexible joints, the Dinxx slings will always rest on four legs as soon as it is loaded with a rowing shell. QHow compact can you make a Dinxx? The Dinxx is foldable in two directions. By strapping the red cord around the legs, you can fix the compact position. 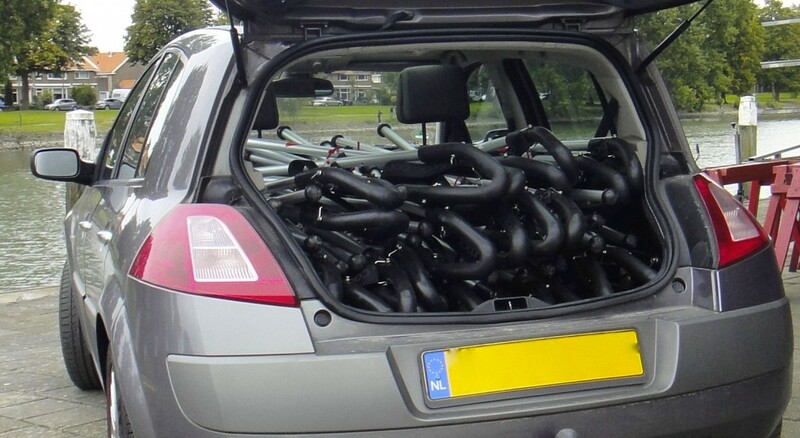 If you fold your Dinxx like this, you can even put up to 30 Dinxx slings in the back of your car. QDoes RowAnnex have any other products? Yes, our SwingRack is even a patented solution. SwingRack is a storage system for smaller rowing shells (singles and 2-/x). With the help of SwingRack, you can store your shells easier, safer and more compact in your boathouse. ZipRack is a storage system for bigger rowing shells (fours and eights). The ZipRack solution is not applicable in case of existing boathouses, but is a perfect fit in new boathouses or in case of renovation projects. ZipRack is still in development. QWhat rowing clubs are already using Dinxx slings? Thanx to the remarkable benefits our slings are protecting boats in the Netherlands at: De Laak, ZZV, De Zaan, Amycus, Alphen Dudok van Heel, DDS, Pampus, Barendrecht, Rijnmond, Gorcumse, Leerdam and Skoll rowing in Amsterdam. QWhy do you advice to put our name on the straps? Usually no Dinxx sling with a name on it will disappear at regattas etc. In case it might happen that after a regatta the Dinxx were put on the wrong boattrailer, that will be noticed afterwards anyway and very likely returned. Thanks to the name, two sets have already been returned to the owner, one set even came back from Norway! QCan I easily use the Dinxx to put the riggers on or to remove them from an 8+? The height of the Dinxx slings makes it easy to work on the 8+. When putting the two parts of the 8+ together, it is better use a third sling at the joint. Each part of the 8+ rests on one of the straps of the sling. QWhat is the easiest way to store the Dinxx in the boathouse? To prevent unnecessary stress to the stainless steel springs within the rubber, it is best is to fold the Dinxx only once and then hang them this way on the wall. QWhere are Dinxx used abroad? Dinxx are used in other countries apart from The Netherlands; Dinxx slings are also used in England, Ireland, Germany, Swiss, Italy, Austria, Poland, Norway, Canada and the USA. QAre spare parts available for the Dinxx? The chance that you need a spare part is highly unlikely, but if any component is needed they are available of course. Q How durable are the Dinxx slings? A It has not been possible to test the Dinxx for a very long period, however the choice of the materials used, promises a very long lifetime.